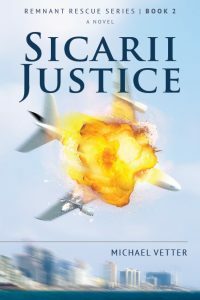 Jake and Angie Cohen return in Sicarii Justice—Remnant Rescue Series | Book 2, to lead a daring mission into the heart of the Caliphate to smuggle hundreds of Christians out of the Kingdom of Saudi Arabia under the noses of Mecca police. Thinly disguised as American billionaires on their first Muslim hajj, Jake and Angie dash from Mecca to Medina and then to Jeddah to escape. They stay one step ahead of a Caliphate policeman and a SWAT team intent on capturing them. Before what the Bible calls the Great Tribulation time period, a group of misguided Christians think that they are doing God’s by trying to alter the arc of history. Saul Rosen, a charismatic Jewish philosopher, manipulates wild-eyed followers to imitate sicarii “dagger-men” who murdered first-century Romans and sympathizers. Rosen’s fanatical Sicarii Justice squad is intent on killing the Antichrist before he can start a final campaign to annihilate the Jewish people. In Tel Aviv, the Antichrist—known as the Prince of Rome or the Principe—survives an attempt on his life by the Sicarii. The False Prophet, the Deputy Principe, orchestrates the Antichrist’s miraculous “resurrection” from the dead and the Satanic genocide of Jews begins. The Remnant Rescue team has its own imaginative plans for surviving the last days that include a low-orbiting space station and Israel’s arsenal of special atomic weapons. While Jake and Angie continue their daring rescue missions, Saul Rosen’s Sicariis have one more plot to disrupt God’s plans for future prophecy. Their twisted scheme unfolds in the last pages of Sicarii Justice!